The Fox Head Flux Helmet for Men is a durable and sturdy helmet built to withstand tough handling. It utilizes twenty massive cooling vents strategically positioned to allow for smooth airflow thereby regulating the temperature in the head zone and comes with deep rear profile with EPS for a much better coverage for the head. For getting the perfect fit, it uses the detox retention method. It comes also with a detachable sun visor. All these features are bulit with detailed attention for bikers with the highest quality as it passes the safety standards set by CPSC. The inside of the helmet is made from a polystyrene foam that can be expanded to fit any head shape and size and it sports and in-mold technology for the outer shell. At four hundred gram, this helmet is one of the lightest available, yet it comes with sturdy features. 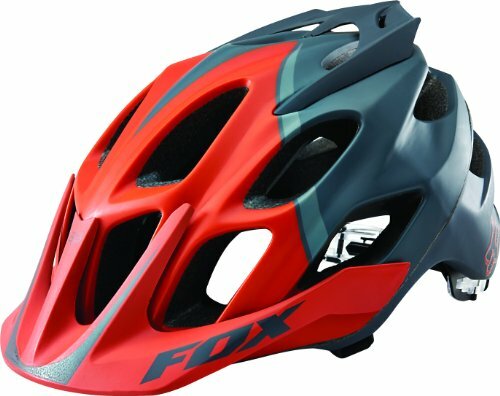 The Fox Racing Flux Helmet comes in varying designs and mulitple beautiful colors. Designed with a rear profile that goes deep on the inside to provide adequate head covering thereby offering total protective features to the entire head. Sports twenty massive vents strategically located to allow for proper entry of cool air and exit of warm air. Utilizes the In-mold technology that forms a hard shell on the outside against a foam material made from EPS to provide a very durable and comfortable fit that wraps the head well and nice. Uses the detox stabilizing method for making spot adjustments on the go therefore eliminate the tendency for a snug fit. Comes with a visor that is detachable and also a spoiler at the rear for better balance. The Fox Head Flux Helmet for Men is a very comfortable helmet utilizing the popular in-mold technology that is known to offer superb protective capabilities. The rear part of the helmet provides more covering as it is deeper than the frontal area. The padding on the inside is nice and soft and won’t make you feel uncomfortable. Adjusting the helmet is very easy and it seems to expand for any head size and shape. It keeps a tight fit without compromising your comfort and the vents do a good job of cooling the head on hot and humid days. The visor is not really up to standard but since it is detachable, it shouldn’t be an issue to worry about. The price tag on the helmet is very affordable and for bikers looking for a sturdy helmet that performs well and is an all-rouder, this helmet comes recommended.